Rust and Go are both system level programming languages. They have a lot in common, but their similarities are not critical to the choice! The crucial point in the choice lies in the differences. We want to explore the salient functional nuances of both languages. We want to know exactly why you should choose Rust for your project instead of Go, or vice versa. What benefits do the architects of Rust and Go intend for us to reap? The answer cannot be discovered simply by inspecting syntax. Ultimately, the real answers to this question touch on the most sophisticated techniques of programming and compiler design! The important differences between Rust and Go are subtle, not superficial. Now, we are talking about functional nuances called programming paradigms. Paradigms differ in methods of concurrency, memory safety management, type strength, and generics, among other things. On this level, everything important depends on compiler methods of handling paradigms such as concurrency and parallelism. Concurrency in rust vs go is a hot topic indeed! Not exactly, but before we get into the mechanics of these two paradigm differences, let’s reach a useful conclusion a bit early on. The Go vs Rust choice depends on which of the unique functional features you need most. Your highest priorities in the design functionality of your coding project will decide for you based on the above list! Let’s look at some specific examples to illustrate the nuances shown above. Before we get into the nuts and bolts, let’s take a moment to clear up some confusion about nomenclature! First, we’re talking about Go programming language. “Golang programming language” refers to the same thing, but it’s not the best way to search. Likewise, “Rust programming language” is the correct usage in searches, and will spare you sifting through hits about a video game! 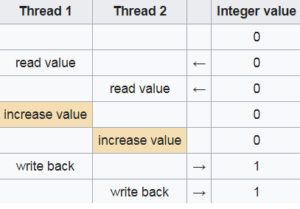 Continuing on the theme of rust thread concurrency, let’s look at a cutting-edge feature of Rust programming language: how Rust manages high thread safety. In fact, thread safety was a foundational goal of the Rust language development project! Rust architects describe their “secret weapon” as ownership. In practice, most memory safety and concurrency bugs result when a module accesses memory which should be off limits! Ownership in Rust is sort of best practice for memory access control which Rust’s compiler can actually enforce statically for coders! How does it work? // now, `vector` is now deallocated! Note that print_vector does not transfer ownership and so the vector is destroyed at the end of its scope! If memory safety is critical in your development then Rust should be on your radar! Here, the thread creates an instance of the vector, transmits it to another thread, and then continues using it. The potential hazard lies in the thread receiving the vector, which could mutate it while the caller continues to run. Then the call to print_vector could result in an error or even be exploited as a race condition. For those who may be new to the concept, threads can interfere with each other if not locked or synchronized correctly. Imagine two threads attempting to increment a global variable, each by adding a value of one. If both run without locking, the outcome could be that both add 1 to zero, instead of adding 1 each in turn, as in the diagram below. Locking and synchronization are implemented in Rust as a natural part of Ownership, leading to increased thread safety. Rust provides syntax to develop an algorithm as a generalization or generic, and then specify the types upon instantiation. In Rust, this is called generics as usual. Go is more circumspect on generics, calling one a closure. And Go developer communities suggest alternatives. Interfaces, for example also serve the purpose of developing a model in generic form. Reflection is yet another paradigm along similar lines. Reflection works with objects even when their types are not available at source compile time. A distinction here is that variables do not necessarily need an initial value assignment (which would otherwise cast the type). If a variable is assigned multiple occasions then it must be marked as mut. We’ve compared the mechanics in our Rust vs Go survey. Now, let’s have a look at what developers are doing with these tools today. Mozilla was the original underwriter of Rust, and so it’s not surprising that the Servo browser engine was built with Rust. What does the Go Language have to compare with this? There is no shortage of success stories here! In fact, as Google’s premier language, Go is currently in use in thousands of system level applications globally. For example, Golang’s greatest strength is web application tool development. This includes Go’s concurrency primitives and garbage collection, which make memory management easier than C.
The best plan to explore Rust system programming is with a clear goal to expand your knowledge of coding paradigms which may be new to you! In other words, we developers sometimes get into comfortable habits. But the world of programming expands dramatically. We must be tenacious and intrepid learners to stay on the competitive edge. Rust and Go are both open source. There is vast community developer interest in both. So, you will find lots of new ideas to explore. In the meantime, check in with ByteScout for the next developer tutorial. Stay with us and stay in the loop! Mark is a freelance consultant and coder in the areas of machine learning, automation testing, and web app development. He currently writes coding tutorials and tech articles regularly for ByteScout. Mark is a resident of Humboldt, California, and enjoys hiking in the redwoods.